So my twins turned 6 recently! Hard to believe that they are in big kid territory now, no longer babies or littles, but full on kid mode! And my Greta (the twins are B/G) is definitely into all that is princess (as much as we tried not to be point them towards traditional boy or girl toys, they just tended to gravitate toward what appealed to them). And Disney totally has the market on all that is princess. You can't get away from it. Since I've been making their birthday cakes for years now, this years' cake request had to be a Disney princess one, and her fav is Belle from Beauty and the Beast. 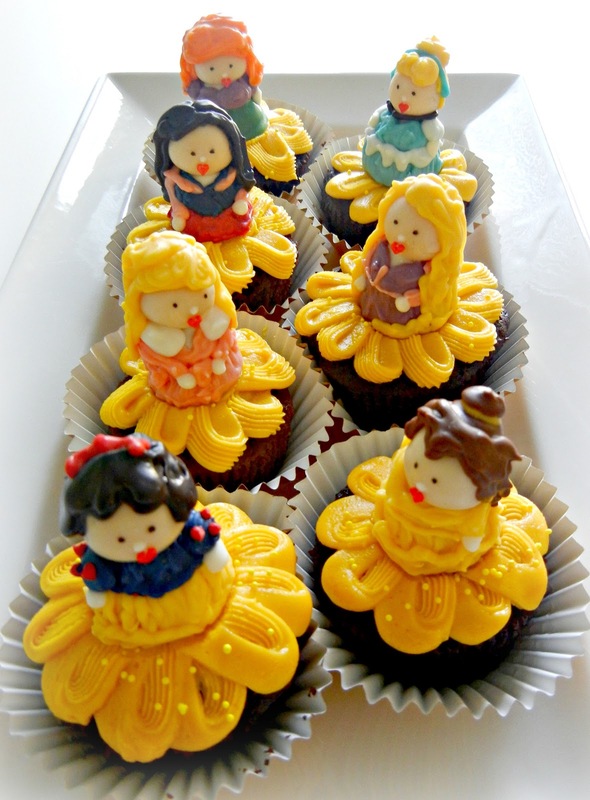 So the request was Belle, with smaller princess cupcakes all around her. Clockwise from the top in case you need help! 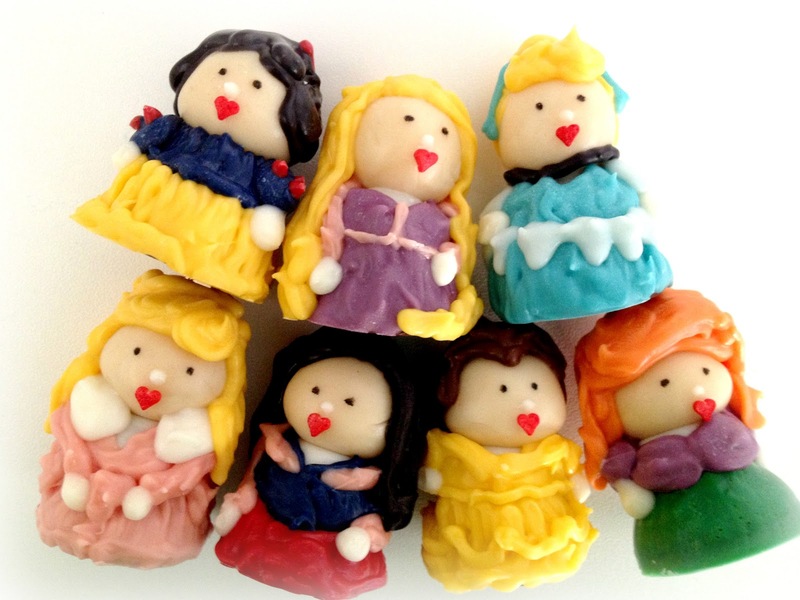 It was kinda natural to do all the little princesses in candy since I've done little candy people a lot before, using Hershey chocolate bells (or you can use Hershey kisses) and vanilla tootsie rolls as the base of the body. All the rest of the detail is done in candy melt, with a tiny heart sprinkle as their mouths and an edible food writer to add the eyes. For more specific info on how to make candy people you can check here or here or here. And the Belle cake came out better than I was thinking too. It's just a Belle Barbie covered in plastic wrap and shoved down the center of a chocolate cake "dress". I used my Kitchen Aid mixer bowl for the dress shape (which worked out great). 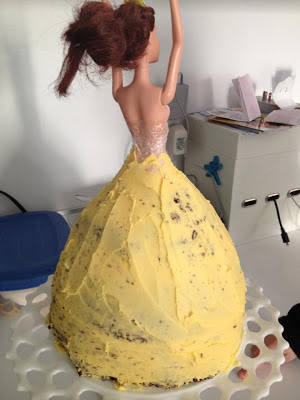 I did need to add a little cake to build her dress up around her waist. There is something slightly wrong with icing a naked barbie wrapped up in plastic wrap! And you get a Princess Belle cake with some little mini princesses to celebrate my princess turning 6! If you can't be totally into princesses when you are six, then I don't know when you can! Happy Cinco de Mayo to all too! There was just too much going on this weekend, between May the 4th be With You (aka Star Wars Day), the Kentucky Derby, AND Cinco de Mayo, I could not prep enough to get everything I wanted done and posts ready, so you get princesses today instead! Have a great week and thanks for stopping by! Thanks hard to believe they are now 6!!! 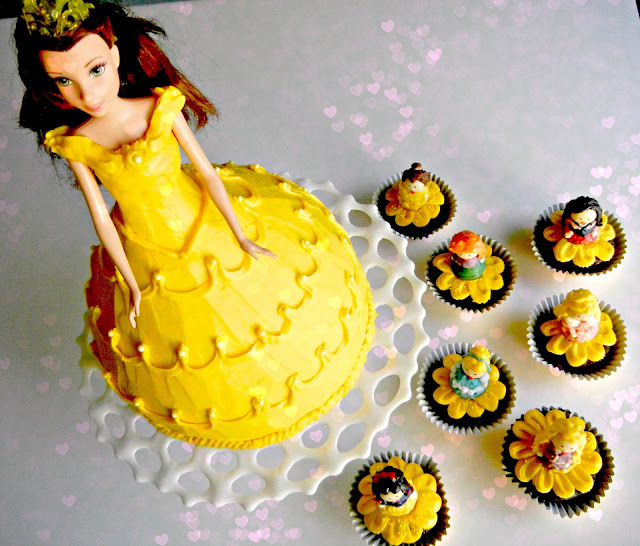 Your princesses are so sweet ;) I made a Belle cake for my niece's 4th birthday, she's now 22 and remembers it! Little girls and princesses seem to go together. thanks!! Snow White is my fav, but Belle is definitely my little one's fav! and yes, that is quite Dexter like!! When I first looked at this picture, I thought the princesses were plastic figurines! They are just beautiful! You are so very talented! THanks a lot Jeni so nice of you to say that!! I always have fun doing these little people. They take some time, but they end up cute! Super Adorable! We are Disney Fanatics! Oh my word these are just too cute!!!!! So much work! I bet your daughter LOVED them! How special. Thanks for sharing at Two Cup Tuesday on Pint Sized Baker. The party will open again on Monday evening! What an awesome birthday cake! I love Belle's entourage; they turned out beautifully! I think they are my favorites that you've done! 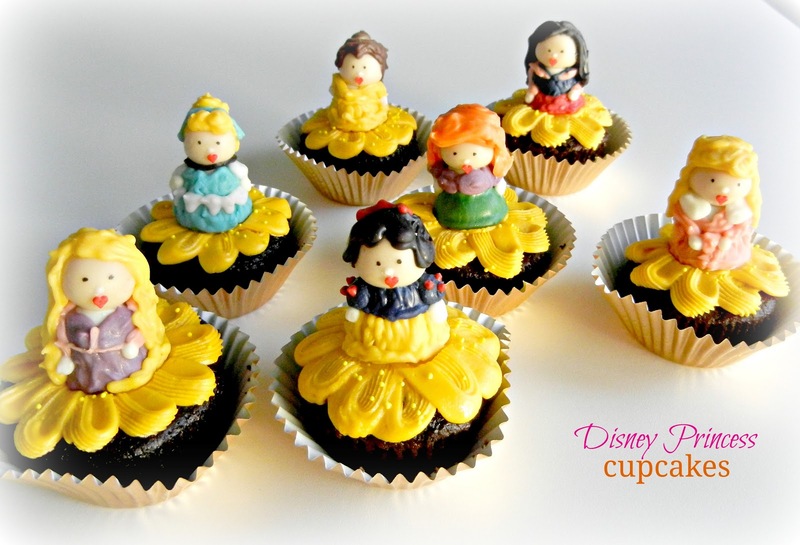 These are the cutest cupcakes ever! Happy Birthday to your cute twins!! We would love to have you share them at our Strut Your Stuff Saturday link party at sixsistersstuff.com and also on our new sister site - MyRecipeMagic.com. Star Wars Treats Round Up!